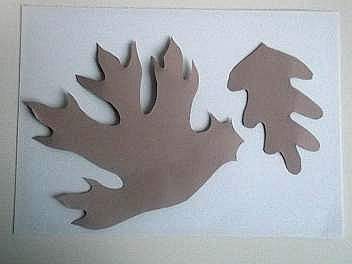 Every time I take a walk outdoors in the Autumn I think of making a leaf mobile. 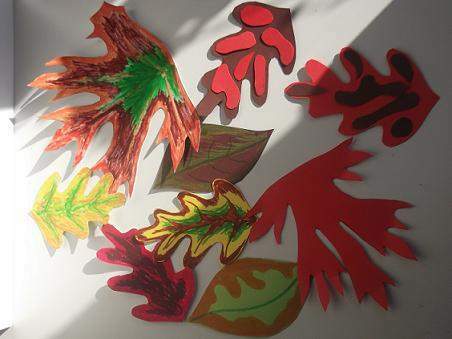 The colours are just too nice and inspire the creativity in me and I am sure the children will love to see those leaf shapes above their heads as if they were falling from the trees. So let`s have a go! You will need to collect some materials together. 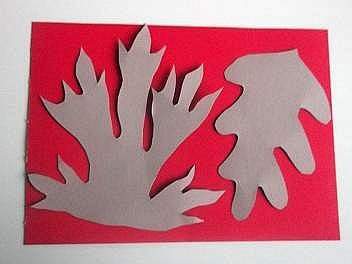 Make some leafy shapes from spare or scrap card. I used card from an old document folder. Did you notice how the shapes were created? 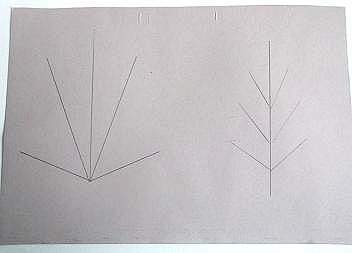 Leaves have veins and they run with the shape of each one. So to make a shape, first draw the veins and then draw around them. These can now be cut out and used as templates. But don`t throw them away! 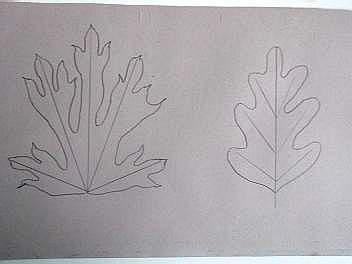 Colour them in later to add to your leaf mobile. If you collect some fallen leaves, look at the network of veins and copy them. Place the templates on the card and draw around them. 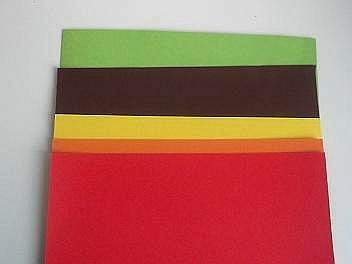 We have used 3 shapes some are large and some small over yellow, orange, brown, red, and green card. 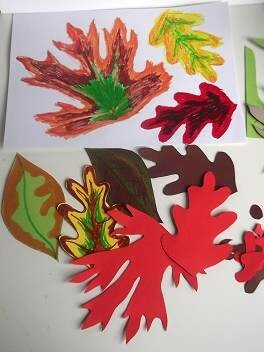 Try using some of the scraps to add contrasting bold patches of colour to leaves. We have also made some white shapes and coloured them in using felt tips and pencils. 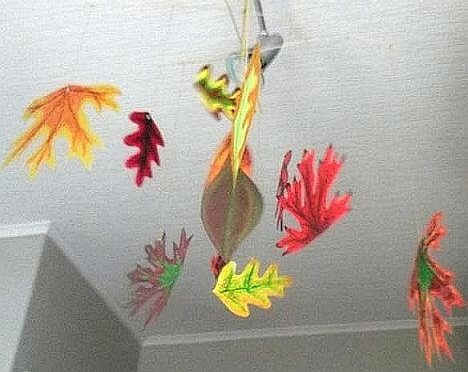 Doing this creates interesting shades of colours adding to a more vibrant leaf mobile. 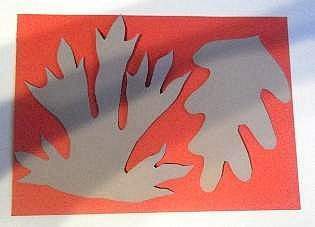 When you have traced out enough, cut them all out and punch a hole anywhere you like around the edge so that when you attach them to the string the leaves will appear to be tumbling as they fall. 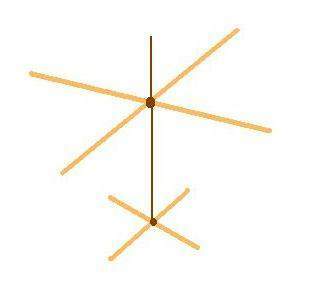 Cut one of the rattan or garden sticks into 2 equal parts, find the center point on both and tie them together into a cross. Wrap the string around them and tie it tight. Adding some glue helps to keep the knot from unraveling. Further along the string tie the other 2 rattans or garden sticks together also at the center points and secure them in the same way but leave a length of string to hang it up when it is complete. Now you can tie the leaves onto the mobile. 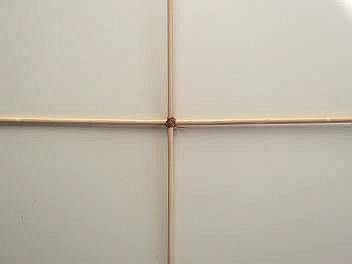 Attach a piece of string or thread to each leave and tie them onto the ends of the sticks first, 8 in all. We used golden, sparkly string as a nice finishing touch. Tie any remaining leaves along the sticks to balance the leaf mobile. When you are finished find a place to display it and where it will not be disturbed. 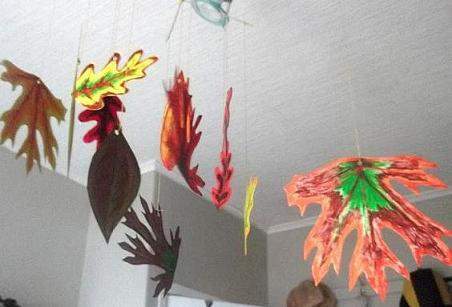 Make some more Autumn Crafts before the season has gone!